This is Baicker's second collaboration with Sam Williams. In this book, three babies are born inside a little peapod. They're seen as perfect little peas in a pod, but the babies each have their own unique personality. They dislike being regarded as a "set" and escape and have their own unique adventures. The three adventures happen simultaneously and highlight each baby's personality. 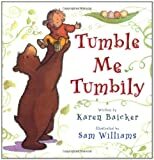 The text is sing-songy and similar to that of the previous book and William's illustrations are equally whimsical and fun. The verse didn't flow well for me as a read-aloud, and therefore the book wasn't as enjoyable to Jonathan. Twins or Triplets might better appreciate this book. Toddlers are notorious for insisting that they can do things by themselves, and this story affirms their desire to be independent. 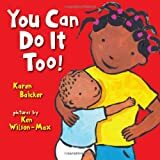 An African-American girl narrates the story, sharing things that different family members can do and then asserts that "I can do it too!" Ken Wilson-Max's bold illustrations show the warmth of the girl's family as well as the girl's imperfect attempts to copy the actions of her older family members. It's a charming book that Jonathan really enjoyed. In this follow-up to I Can Do it Too! the same little girl is trying to teach her little brother the skills she has learned. There's obviously a warm relationship between the siblings and I think, as a big brother, Jonathan could relate to this story. It was another book he requested that I read "again!" Just came across your older post ... 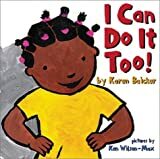 I'm going to check out I Can Do It Too. 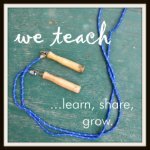 I'm teaching my toddler about helping to dress & undress among other things and hope this spurs him on! The Peas in a Pod looks adorable too.